This 34mm. 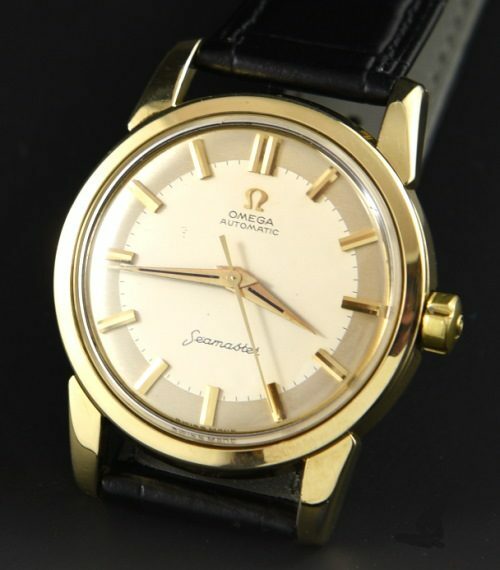 OMEGA SEAMASTER dates to 1955 with the near pristine gold capped beefy lug case and steel snap back. The dial is amazing-completely original two-tone stunning dial with original Dauphine hands….WOW! The crown and crystal are both correct OMEGA.The automatic OMEGA caliber 501 was just cleaned and is accurate. Jump on this watch FAST! Only $1250.